Habit: Perennial herb (subshrub), 3.5--10 dm, green, +- glabrous. Stem: erect, dark brown to red, generally hollow. Leaf: cauline; stipules 7--15 mm; petiole 3--5 cm; leaflets 5--9, 20--40 mm, adaxially glabrous. Inflorescence: 15--50 cm, open, flowers +- whorled or not; peduncle 3--15 cm; pedicels 5--10 mm; bract 8--10 mm. Flower: 12--16 mm; calyx upper lip 7--8 mm, 2-toothed, lower 7--9 mm, entire to +- 3-toothed; petals violet, banner back glabrous, keel upper margins ciliate claw to tip, lower glabrous. Fruit: 3--7 cm, dark, sparsely hairy. Seed: 7--8, 3--4 mm, mottled brown with black line. Ecology: Sand or gravel; Elevation: < 500 m. Bioregional Distribution: NCo; Distribution Outside California: to British Columbia. Flowering Time: Mar--Jun Note: Grades +- into blue-flowered Lupinus arboreus, but flowers earlier (late winter, spring), not sweet-smelling. Unabridged Note: This high number of possible range extensions possibly due to Lupinus latifolius, which has been segregated from Lupinus rivularis. 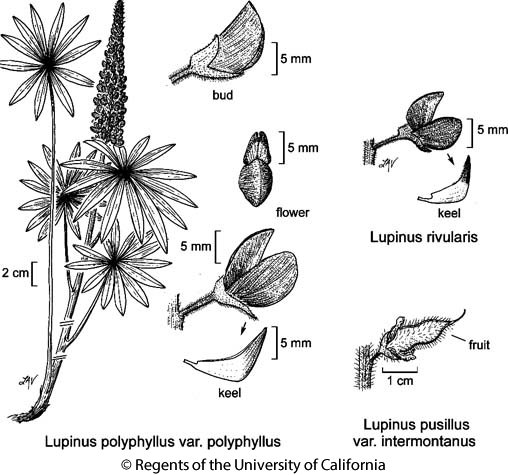 Citation for this treatment: Teresa Sholars & Rhonda Riggins 2012, Lupinus rivularis, in Jepson Flora Project (eds.) Jepson eFlora, http://ucjeps.berkeley.edu/eflora/eflora_display.php?tid=32046, accessed on April 24, 2019.